We’ve come to the end of our Fawlty Towers coverage for this first series, likely sooner than any of us hoped or wanted. 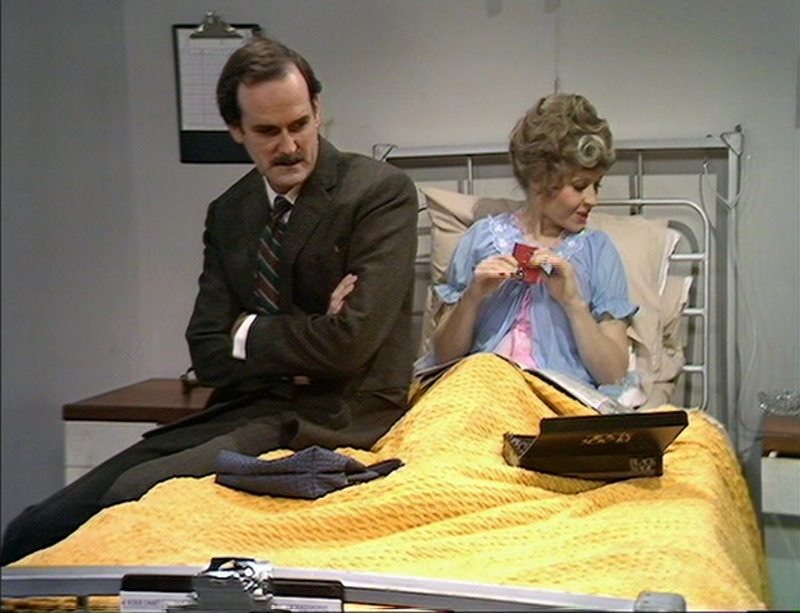 While most comedies tend to get 13 or 22 episodes a season, Fawlty Towers only had six episodes in its first outing, not at the request of any network but at the decision of John Cleese and Connie Booth. The two, who wrote every episode together, were so convinced that each episode had to be perfect that every script went through constant revisions and took weeks or even months to complete, a pace that couldn’t have supported a run of even a half-season. And given what we’ve seen so far, quality over quantity was the right choice to make. So far these pieces have been fairly light on substantive criticism, a deficit I apologize for, but that’s mostly because I’m hard-pressed to think of anything negative to say about the show. It may be short but what there is has been polished to a mirror shine, barely any scenes or lines out of place, masterfully executing several different flavors of farce and misunderstanding with the eye of a craftsman. “Gourmet Night” and “The Germans” continue that trend, ending the first series on a high note that exaggerates all of the existing tensions and pushes them beyond the pale. Summary: In an effort to climb another rung on the social ladder, Basil arranges a gourmet night. Unfortunately, thanks to the chef’s alcoholism, Basil must try to get hold of a duck. If “The Wedding Party” and “The Hotel Inspectors” were comedies of error, “Gourmet Night” is an illustration of another classic comedy convention: the setup where everything that can go wrong does. 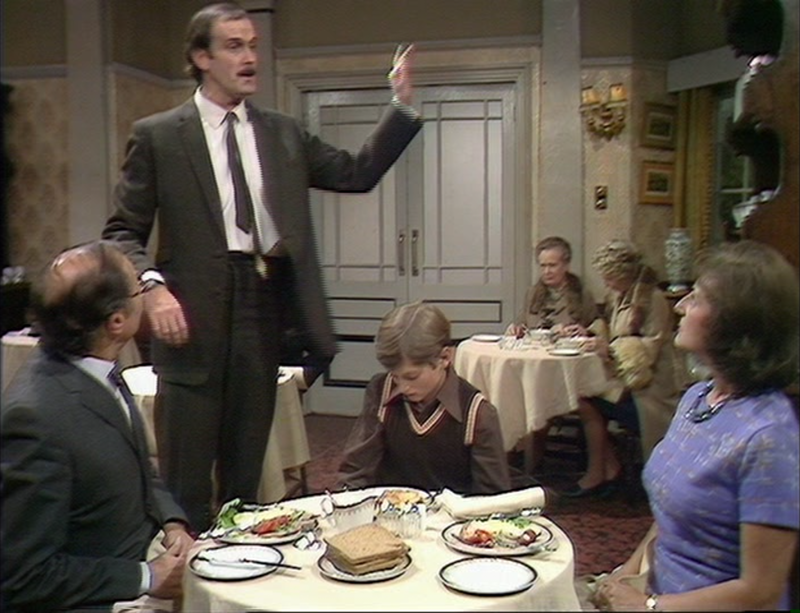 It’s already been established that Fawlty Towers is not a well-run hotel—managers who are either lazy or high-functioning sociopaths, bellhops who don’t understand a single instruction they’re given—but the hotel seems to function well enough to support itself and even keep on a couple regulars. (Granted, regulars who are half-senile, but regulars nonetheless.) In “Gourmet Night,” the hotel tries to become something more than it is, and the results are nothing short of catastrophic. 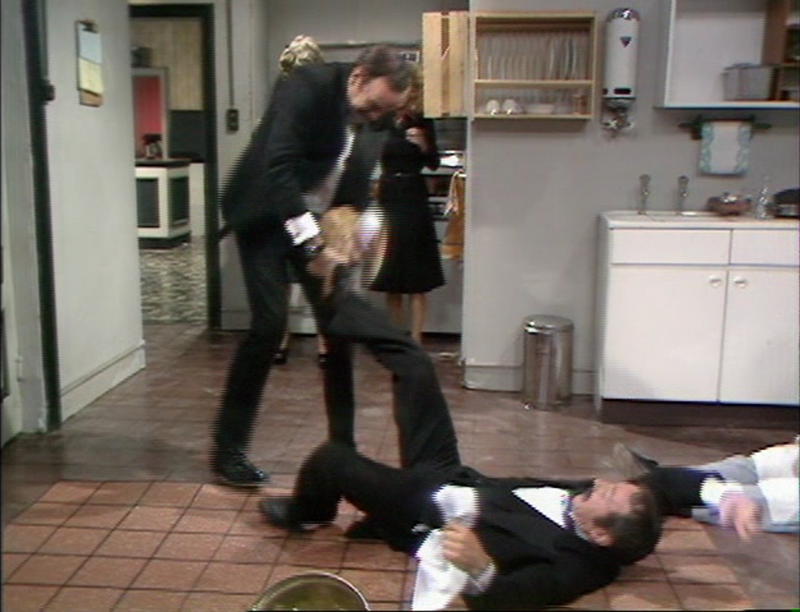 Interestingly, the episode opens where everything seems to be going well for once in the world of Fawlty Towers. A restaurateur friend of the Fawltys has recommended a new chef named Kurt, who is quickly bringing the kitchen to a new level by virtue of his training and novel ideas such as using fresh ingredients. Kurt seems to be leveling out the hotel’s more chaotic elements: being an affectionate friend to Manuel, buying one of Polly’s sketches, and even cooking so well that it mellows out Sybil enough to joke with Basil as opposed to simply bossing him around. (Though the feeling’s not mutual as he caustically jokes that his “little piranha fish” should throw back another “vat of wine” in order to keep the mood going.) True, Basil’s car isn’t working because he’s too cheap to take it into the shop, but that’s a problem easily fixed—in his mind at least—by telling Sybil he did and driving it just out of sight of the hotel. A few people do respond to the ad though, including a colonel and a leading rotarian, which once again means we get to see the wonderful demonstrations of exactly why Basil’s never managed to make his way to a higher social class. 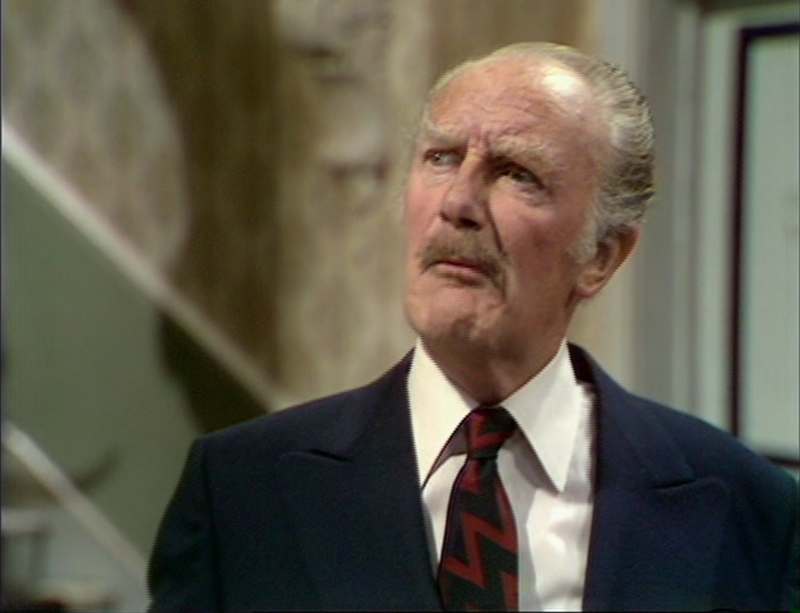 Basil tries to present himself as a gentleman, but as happened with “Lord” Melbury, the instant he’s presented with anyone he’s trying to impress he loses any grasp of what makes a good impression and only makes it worse. It’s faux pas after faux pas as he tries to make conversation (“How’s that lovely daughter of yours?” “She’s dead.”), forgets the order of conversation (“May I introduce my wife?” “She just introduced you!”) and ties himself up in knots when he forgets a name in the middle of introduction. 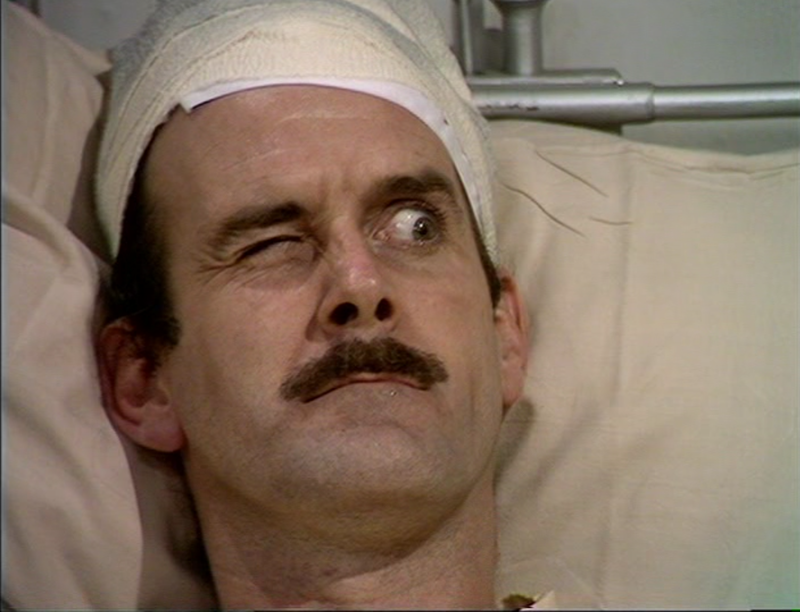 I’m not a fan of cringe comedy as a rule, but the expressiveness of Cleese and the sheer pain on his face as he looks for a way out is fairly universal. Additionally, keeping the reveal off-screen allows Polly, usually the quieter member of the ensemble as the straight woman to the hotel’s varying degrees of insanity, to take a more active role trying to get the truth across. Connie Booth’s quite terrific in trying to find the safest way to pass the news onto Basil, “He’s potted… the shrimps! He’s soused… the herrings! He’s pickled the onions and he’s smashed eggs in his cups… under the taaabllllle!” And then when she finally gets through to Basil, it’s a terrific moment where she repeatedly tells him to put a bottle down, and he refuses, and once the news comes out he demonstrates exactly why she wanted him to put it down. The hotel staff tries a long list of things to keep the event going, but none of them do much to make the gourmet night seem like it’s fit for public society. After getting Andre to cook a duck for the guests, Basil’s forced to rewrite the entire menu to three options: duck with orange, duck with cherries, and duck surprise (without orange or cherries). The dishes they’re able to serve are hilariously swapped by Manuel countless times, and when they finally come up complaints range from “This isn’t cooked!” to “There’s a hair in my mousse!” And then when Basil finally does get the duck into the kitchen, it turns into an last-minute disaster worthy of the Marx Brothers as he’s entrapped by the door, the duck hits the floor and Manuel’s foot, Basil hits the unconscious Kurt, and it’s back to square one. But Andre is an understanding sort, who’s perfectly willing to prepare a second duck for his friend, which Basil heads back to pick up. And once he gets there, he’s so relieved and distracted that he misses the most important detail—there are two covered trays on the countertop, and the one with the duck is the one whisked away by an unsuspecting waiter. The fact that he never even glances under it speaks to the mania that distinguishes this episode, and robs it of any chance the night could still end well. But let’s leave that alone for a moment, because on the way back it’s time for Chekov’s engine light to go off. The car Basil was too cheap to get fixed finally dies on the side of the road, and all of his repair efforts for naught he’s reduced to screaming at an inanimate object, giving it to the count of three to start. What follows from that is simple catharsis, as he emerges from the vehicle screaming and yelping, resolving to give it a “damn good thrashing.” This moment is credited as one of Fawlty Towers’ most iconic, and it’s not hard to see why: every bit of frustration held toward Sybil, the hotel guests and even himself expressed in the impotent thrashes of a tree branch. Basil then runs all the way back to the hotel (after I assume uprooting an entire tree and grinding the entire car into powder), where the staff has tried virtually everything to distract the guests: Manuel performs a flamenco, Polly sings show tunes, and Sybil’s found another vat of wine and is telling stories about her working-class uncle. The covered tray is then brought in with full ceremony, Basil’s heavy breathing now completely smoothed over, and he sharpens the knives in triumph and lifts the lid. In place of the duck? A large, well-decorated trifle. After the abuse of the car, this is a muted, wonderfully numb close to the episode: Basil doesn’t even have the energy to get angry again, all he can do is bewilderedly rummage into the trifle to see if maybe there’s a hidden inside. Summary: With Sybil in the hospital with an ingrown toenail, a moose’s head to hang up and some German guests arriving the next day, Basil has his work cut out for him. Ask any Fawlty Towers fan to mention the phrase that comes to their mind when they think of the show, and those four words are likely at the top of the list—possibly in contention with “He’s from Barcelona,” but that had the advantage of being a recurring catchphrase. “Don’t mention the war” is the centerpiece of “The Germans,” the first series finale of Fawlty Towers, an episode considered one of the show’s finest and also one of the funniest episodes of television in general—friend of the site Robert David Sullivan even named it #65 on his list of the top 100 sitcom episodes of all time. So what makes “The Germans” stick out so much, even amongst the high caliber of episodes that we’ve seen? 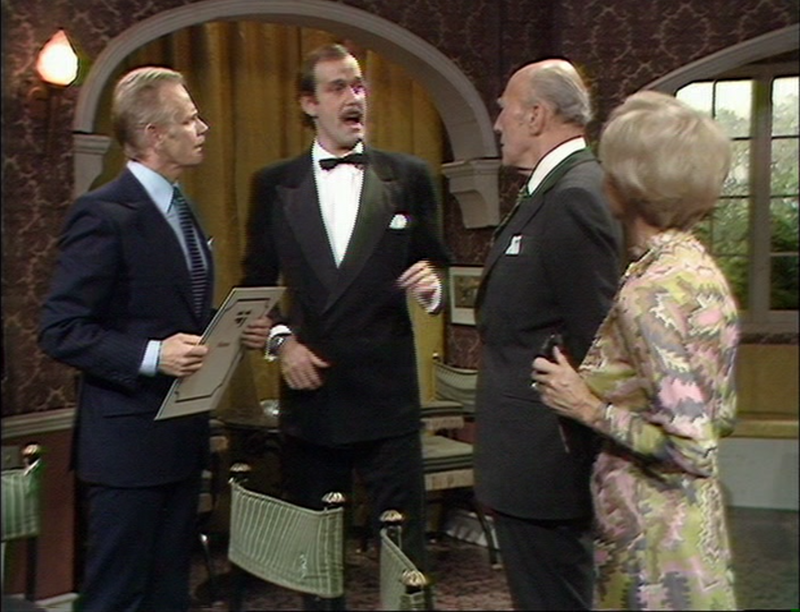 Simply put, this is the episode that presents us with Basil Fawlty unchained. In the last five episodes there have been plenty of points where Basil’s lost control of himself, pushed to ever-increasing outbursts and leaps of logic, but he’s still been restrained by the scalding words of Sybil and his exaggerated British sense of propriety. “The Germans” strips both of those controls away, and it exposes Basil’s true character or lack thereof, and transforms his usual inability to connect with people into high-functioning sociopathy. And true to form for Fawlty Towers, it’s not content to strip away that control right away; the episode builds to the collapse gradually. It opens with Sybil in the hospital, about to undergo a minor surgical procedure that will take her out of the hotel for three days, leaving Basil in charge of the hotel. 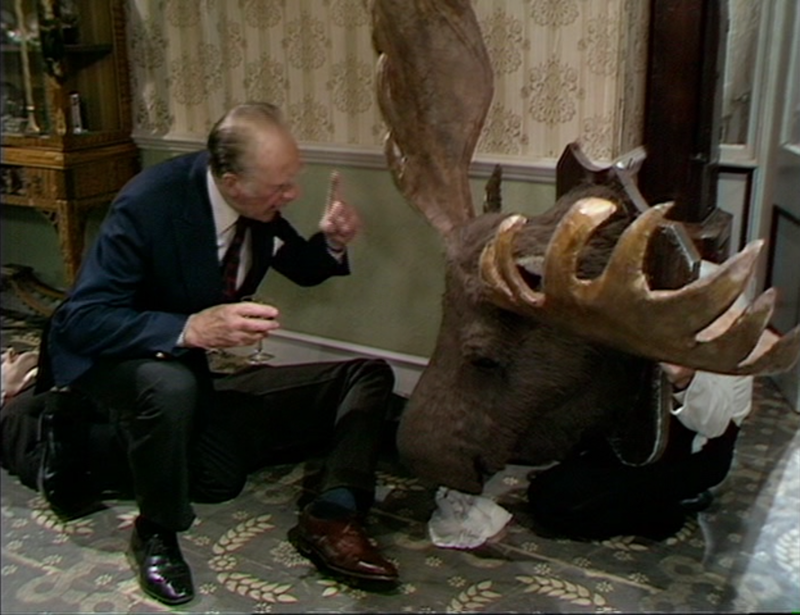 Nominally at least, given that she spends most of Basil’s visit ordering him to retrieve various things from around the room and (shades of “A Touch Of Class”) lectures him about hanging up a moose head he picked up for the lobby. (His rationale for picking it: “A touch of style about it.” Sybil’s counterpoint: “A touch of mange about it.”) Her entire stint in the hospital serves not only to underline how little she trusts her husband, but also how pleased he is to be free from her iron grasp: the quiet moment of glee he has after the doctor tells him how much pain she’ll be in says worlds about how little affection there is between the two of them. And if you’re bothered by it, any hard feelings you may have towards the character are dispelled by the misunderstanding rendered when he returns from the bar to see the moose head sitting on the desk, and Manuel practicing his English conveniently behind said desk. He’s the only member of the ensemble who could be so perplexed in that instance, and the expression of terror is pretty terrific. “Gourmet Night” was an episode where everything that could go wrong does, and “The Germans” is an episode where everything that can be said wrong is said. Basil’s obsequious nature has turned into a pathological desire not to offend, and in his efforts to do so he digs an even deeper hole with every word. He insists to every member of the hotel staff not to mention the war, but there’s nothing else he can mention, making it worse and worse every time it comes up. But it’s all right, because there’s a strategy to make it better, an impression Basil thinks will get the best results. From there, it all ends in tears and chaos, as of course it had to. The doctors come to take Basil away and he manages to give them the slip, collides with Manuel and sends the moose crashing onto his head yet again, and the major walks by at just the right time to see Manuel (now sporting the moose’s head over his own) and cast the blame for the whole incident on him: “You naughty moose!” At such a spectacle, the German guests completely lose any offense at mentioning the war and simply look pityingly on the the remnants of the empire that beat them. And really, by the end of this series, for everything he’s said and done, being pitied is the only thing Basil can reasonably hope for.